The Art of Books: Just to Read or a “Novel” Medium of Art? For hundreds of years, books have been used to share stories, information, and ideas. Always written and bound, books are sources for reading interesting, and sometimes not so interesting, material. Yet books provide material for more than just pleasure or classes. Books are physical materials for artists to work with as well. They can become paintings or sculptures that take the word “novel” to another meaning. Book art is the field that encompasses all aspects of creating and manipulating the structure or concept of books to make art. This includes the very act of creating books using typography, printmaking, and binding, but also extends to utilizing the physical aspects of books to create new forms such as paintings or sculpture. As society has advanced, the role that book play has been changed. With the internet gaining information about all ones of things, the need for dictionaries and encyclopedias has decreased. Those types of books are not nearly as popular as they used to be, and probably never will be. However, books as a pleasurable pass time always will be. As books change in the function that they have filled in the past, people find new functions for them. Reusing books as at art material gives them new life, rather than letting them rot in a box because nobody wants to read them. There begins the debate of where the line of respect for books is drawn. For example, there is an artist who took pages from three major religious texts and connected them with a large scale drawing of tree roots. One one hand, this could be viewed as religiously disrespectful, but on the other, the message that the artist is spreading is one of acceptance and love. The difference between these two points of view is utterly dependent on how a person feels towards the books in use. The books chosen to create the art can be very important to the message that the book shares depending on the meaning of the piece. The use of books in painting has varied from being a prop to being the canvas. Books have been part of still lives and portraits for years, but now, book pages have replaced canvases. Many artists paint directly onto old book pages, making the text a part of their piece. These pieces can be about anything, possibly relating to the text itself, but sometimes not. As always, the decision is to the artist in what they wish to portray through their piece. Similarly, in sculpture, the decisions in how to manipulate the book are a bit more obvious to the viewer than paintings. 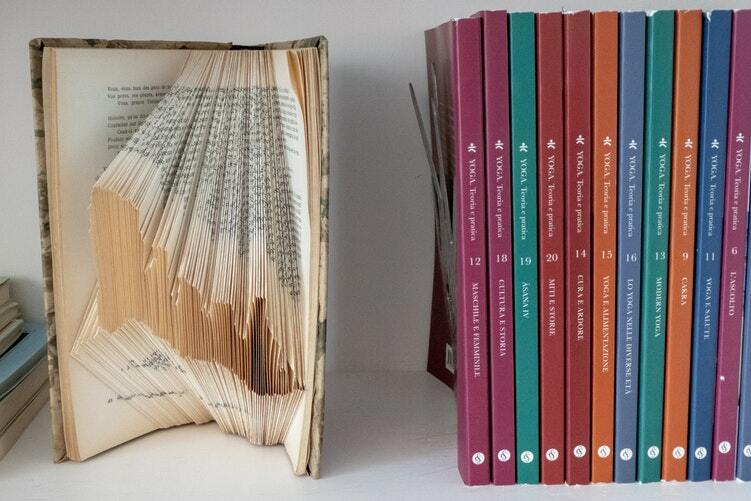 Sculpture mutilates books by cutting, carving, ripping, etcetera, the cover and/or pages to create. Compared to paintings, pages are simply torn out of books, which can be seen as significantly less defacing than methods of sculpting. Books are seen as precious items to many people and it pains them to see book defiled. For people, to see beloved stories ripped up and covers cut into, it brings up sadness as if the book were an injured person. On the other hand, using books in art can be seen as an honor. An artist can choose precisely which book will fit their intention. The art piece may have a revelatory meaning, or a critical meaning, but either way the book was chosen for a message. Even if there is no relation between the content of a book and the thoughts behind the piece, artists usually mean well when it comes to using books in their art. So the overarching question of whether or not books are just for reading or also material for art is not a simple question to answer, the mount can be found within one’s own thoughts when viewing art pieces created from books.